Disclaimer: this is only a small summary of what I saw in the exhibition at the British Museum, or of my reactions to it! The first thing I really noticed when I came into this exhibition was a video of the fall of the Berlin Wall on the 9th November 1989. I can still feel the intense, almost incredulous joy and sense of release of that event; having seen and loathed the Wall every time I had been to Berlin before that. As previous readers of my blogs here will know, my family come from a portion of Germany so far east that now it is no longer Germany and never will be again; but I had family members who lived and died on the wrong side of the wall, and so I never knew them. Moreover, I had read German at university, concentrating on literature, and there were places I had only ever visited on the pages of books; oh, I could have travelled to them, yet the Wall seemed to place them out of reach, in a different world, almost. I love the above photograph, because it shows a horde of little people, with small hammers, tapping away at the hated obstacle. I have a piece of the Wall in my study, chipped away by one of my husband's colleagues on the 9th November, perhaps in a scene like this. It looks so easy that one might ask: 'Why didn't they do it before?' but anyone who had seen the Wall, with its armed guards, its alarm mechanisms, its floodlighting, can give the answer to that. On the other hand, the people power to get it down had come from the numerous brave demonstrations on the eastern side, people armed with nothing but candles, wanting peace and real democracy, not the kind imposed on the so-called German Democratic Republic by Stalinist apparatchiks returning to Germany in 1945. I had forgotten that this was the year of Tiananmen Square, which makes you realise how dangerous the marches felt to those participating in them, and indeed, the armoured cars were there, the troops appeared, only - thanks to Gorbachev, I suspect, they weren't deployed. This poster was also placed there: 'We are a people' a woman entering behind me translated, so I turned round and corrected her (because it seemed important) 'We are ONE people.' Which is what it meant. And yet - inspiring though the poster, from the demonstrations in Leipzig, is, what the exhibition celebrates is the diversity and messiness of what it means to be German, something more defined by language than anything else, which would annoy those nationalists rightly lambasted by Simon Winder in Danubia, who want to prove that Europe can be divided into neat categories who never mix. It would also annoy some Austrians, but that is too bad. Taking my own heritage as an example; my mother was born in Zabrze in Upper Silesia; some of my grandfather's ancestors came from Austria as Protestant refugees from Tyrol, others from Bohemia, as it then was. My grandmother had a Polish maiden name and spoke Silesian, which was and still is, apparently, a Slav language with German accretions. Till 1946, when she was cattle-trucked 'back' to Germany, my mother lived in Silesia and in Graz, Austria. Till I was ten, in fact, I believed I was half Austrian. My mother then told me no; I was German, but I do feel very at home in Austria and can speak the language more happily than I can the language of North Germany, which (in its raw, ungentrified form,is not a million miles away from Flemish or Dutch. This introduces a different aspect of the matter; that of language. Though to be German, in the past, was more defined by language than anything else (Walther von der Vogelweide, writing at the turn of the twelfth/thirteen century, uses the term 'tiuschiu zunge' for 'the German people', but zunge means tongue, therefore language), there is the diversity of the language to be taken into account. The version of German I speak is a rather gentrified kind of Alemannic German, which is spoken in most of South Germany, apart from the Rhineland, where Platt (Low German, or North German) is spoken. I learned to speak this as a child, incidentally, and thus had never any difficulty in Alsace, where they used to speak Rhenish German, though French, apparently, is gaining more and more ground. If that sounds complicated; well, it just is. Because under the Holy Roman Empire (of the German nation), which lasted till the Napoleonic era, Germany was a conglomeration of smaller and larger units, duchies, electorates (whose rulers had the right to elect the Emperor), all of which had a degree of autonomy (is that the right word?) but nevertheless owed fealty to the Emperor. The extent of the autonomy was demonstrated during the Reformation, with some rulers becoming Protestants, others remaining Catholic, though the Emperor was definitely Catholic and in cahoots with the Pope in Rome, hence the Roman bit. There was a decision made (not always stuck to) that 'cuius regio, eius religio' which is Latin for 'whoever rules decides the religion of their domain. This variousness persists in the form of what the Germans often refer to with rolled eyes as 'Die Länder!' ie, the federal states who all have their own ideas about how things should be done. 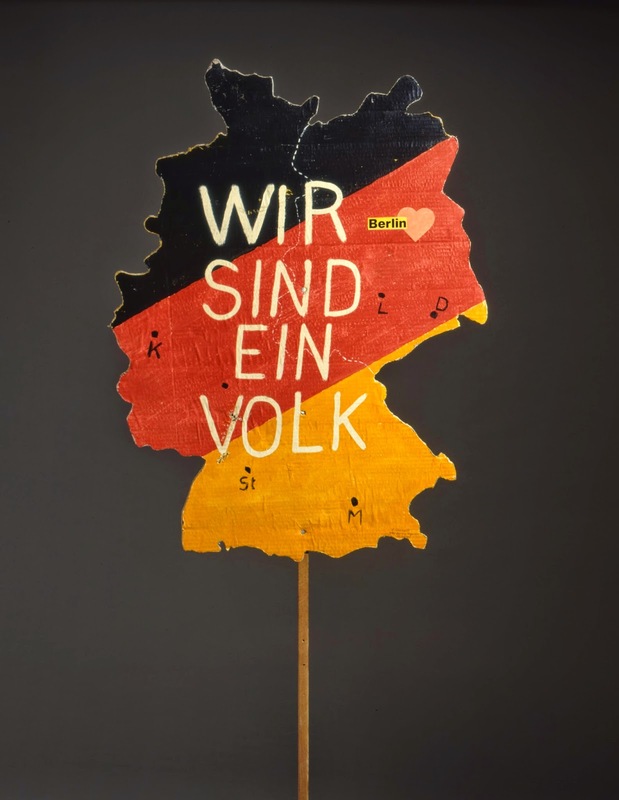 The exhibition tends to regard German diversity as a very positive thing; the enlightened Berlin bureaucrat looking at the intransigence of a Bavarian ultra-conservative Parliament may have a different idea, but hey.. it works. And I personally think Britain could learn from it. If Scotland is not to have its independence, what about a federal Britain, with England itself subdivided? However, possibilities for a federal Britain is this is not what this blog is about! A kind of standard German was established, as the exhibition will tell you, by Luther when he translated the Bible, though I have also heard it referred to as 'stage German' and my mother used to call it 'High German,' but this is confusing, since 'High German' also means Alemannic German (or I think it does, any philologists who know better are invited to comment.) However, a Bavarian, speaking posh, will still be speaking a very different language from a posh-speaking Hamburg person. What I really liked about the exhibition was the way in which it opened up to non-Germans the rich and amazing German culture, which particularly British people don't have much idea about. There were some things that were new to me - like the exhibition of different coinages struck (sometimes only symbolically) by all those different little dukedoms and principalities - when I saw them, it made sense, but to one brought up on the post-war Deutschmark and pfennigs, it seemed strange to see just how many different kinds of Talers there were. The several versions of Euros are nothing to it. 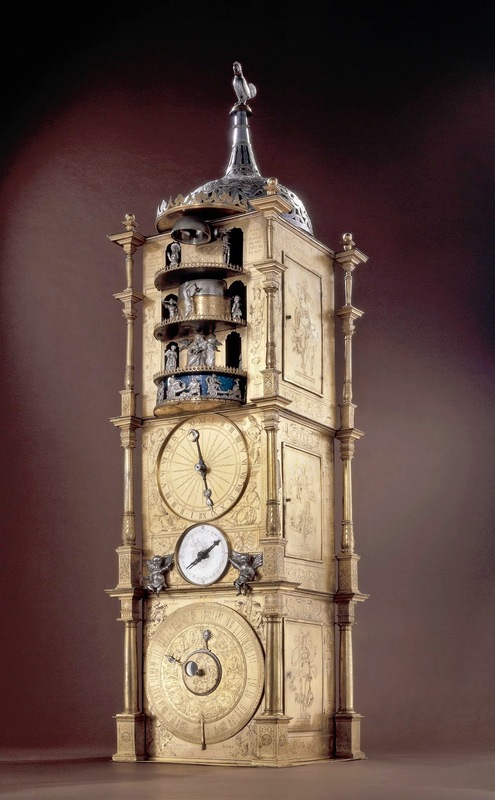 This beautiful clock is now no longer in the cathedral at Strasbourg (or Strassburg, as it was once called) but the British Museum are lucky enough to have a reproduction of it. On the hour, angels sing (or rather, tinkle) and Death emerges to strike the hour, only then the figure of Christ comes out to banish Death.The clock's dials show the length of time till Judgement Day, a piece of German technology which could be pretty impressive, though when I joined a small knot of people to wait for twelve o' clock, we were disappointed. We got the angel song, but Death wouldn't do his stuff. I was lucky, for I had heard and seen an unscheduled strike of Death's hammer at about half past eleven. So I wouldn't be too sure about the projected remaining length of time for the world. However, what the clock awoke in me (it is there as a monument to German Renaissance humanism) was the memory of standing in various cities (Vienna, Munich spring to mind) waiting for the clock to strike twelve and music to play and little figures to emerge and process, or dance, or fight, or whatever else. Beside the clock were various German romantic landscape paintings, one of the Riesengebirge/Karkonosce/Krkonosce mountains, where my grandfather was born, a scene I recognised from going there a few years ago, one of the island of Rügen, a place I visited in 2003, partly because my mother used to have holidays on the Baltic coast, and partly because I had read about it in Fontane's 'Effi Briest.' It used to be on the wrong side of the Iron Curtain, as was the Riesengebirge. There is also a painting by the wonderful Caspar David Friedrich of a German oak (Germans, like English people, view the oak as peculiarly their own). This oak has big broken boughs as well as green ones, it is an aged oak that has had a few lightning strikes, but still burgeons, and if it symbolised Germany in the 19th century, when it was painted, it is an even more appropriate symbol now. Friedrich is in any case a sublime painter, and it is worth going to the exhibition just to see one of his paintings. Even better to go to Dresden, or Berlin, where there are a good many of them. The above carving of the four Gospel writers, by Tilman Riemenschneider, is another good reason to visit the exhibition. Riemenschneider is a wood-carver little-known outside Germany, but he was enormously productive and famous in his time. He was, as well as an artist, one of the mayors of Würzburg at the time of the Peasants' Revolt, and he and the rest of the town council opened the gates of the city to the rebels in 1525. He has thus been celebrated by the Left as a hero, for it was said that he was tortured, and as a result could never carve again. Whatever the truth about Riemenschneiders's fate may be, you can see from this sculpture alone that he was a genius with wood. It is an intensely powerful piece. I have seen many marvellous carvings in my life (mainly in Germanic lands), but this has to count as one of the most wonderful. The Peasants' Revolt was the subject of a set of prints by the great 20th-century artist Käthe Kollwitz, who also dealt with the subject of the Silesian weavers' revolt, which I learned about through studying the Silesian author Gerhart Hauptmann's The Weavers at university. She is also pictured in the exhibition, twice, later on. Here is one of the images, a self-portrait. Kollwitz's younger son Peter was killed early in the First World War, and I read through her moving and fascinating journal of those years to inform my ideas about that period when I wrote my contribution to Stories of World War 1. 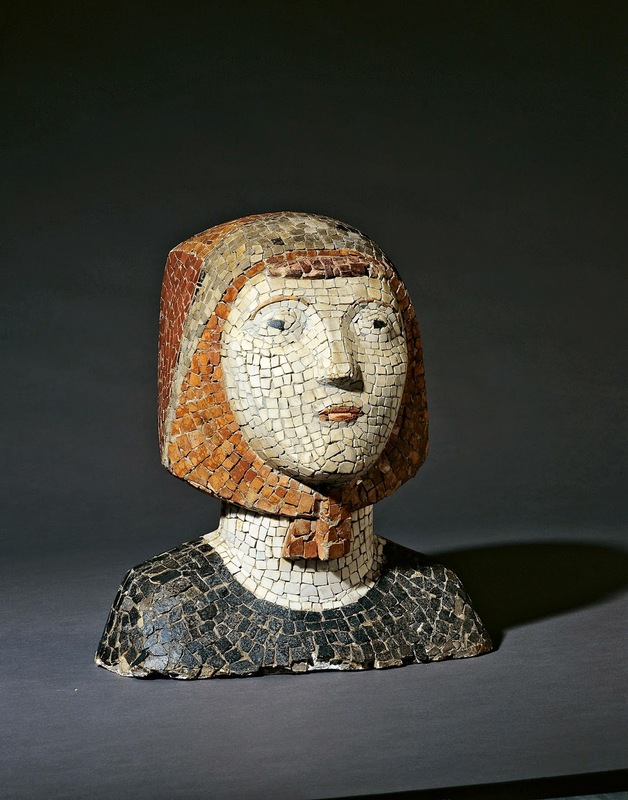 She travelled from a passionate nationalism, provoked by the war, to a heartfelt and agonised pacifism, which is powerfully expressed in her work. She was forbidden to work by the Nazis, and died before the end of the war. 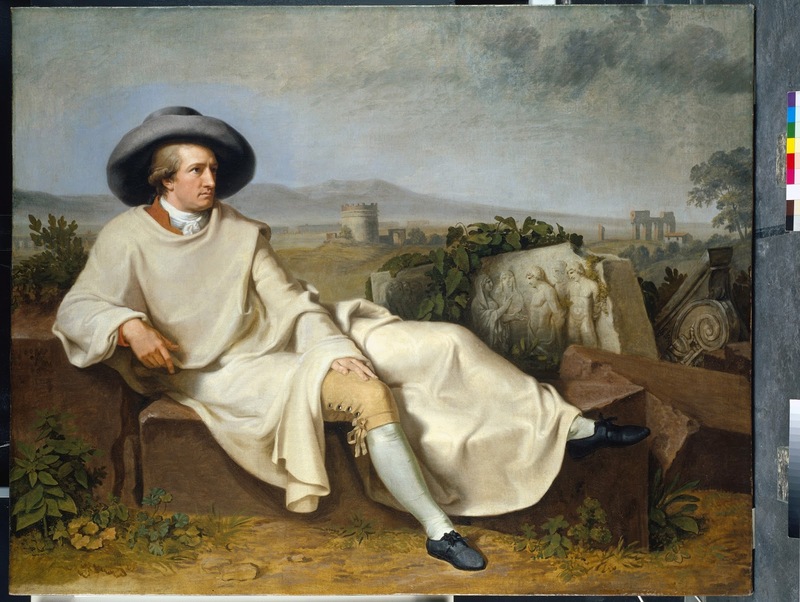 This iconic, in every sense of the word, painting, is Johann Wolfgang von Goethe, who has in Germany the kind of status that Shakespeare has in England. A towering figure, he gained an international reputation with The Sorrows of young Werther, which is not my favourite of his works, but which was read with the kind of attention and disapproval as the Beatles music evoked in my childhood. Werther's eventual suicide (which, when I read the book, I hailed with relief, I am afraid) was supposed to have sparked copy-cat suicides all over Europe and was the voice of revolt against Enlightenment rationalism and the nascent Romantic movement. Jane Austen sniffed and wrote Sense and Sensibility, and if Marianne Dashwood hadn't read Werther I would be very surprised. But there is far more to Goethe than Werther. He went on to write novels, superb poetry, and plays, notably Faust, though there is some question as to whether Faust is in fact a play or a poem. I have seen the first part performed, anyway, and it works. Goethe was also a statesman, and a scientist; in fact his discovery of the intermaxillary bone helped Darwin formulate his theory of evolution, as it links us to other great apes (I think). He also formulated a colour theory, though Newton's won, and a plant has been named after him, goethea cauliflora, which is not (as you might think) a vegetable, but a rather pretty flowering thing. I was very glad to finally see the painting, which usually lives in Frankfurt, a city I have never spent time in. Goethe had semi-divine status with my mother, and, like the Greek Gods, was thus allowed to get away with all kinds of behaviour and writing which she unhesitatingly condemned in lesser writers, such as the womanising by himself and by his characters, and his lack of conventional religious piety. In this, my mother was quite typical of members of the German 'Bildungsbbürgertum', a term very hard to translate, because though you can render it as 'educated middle class' this English term conveys nothing of the reverence and deep love of culture that goes with it. 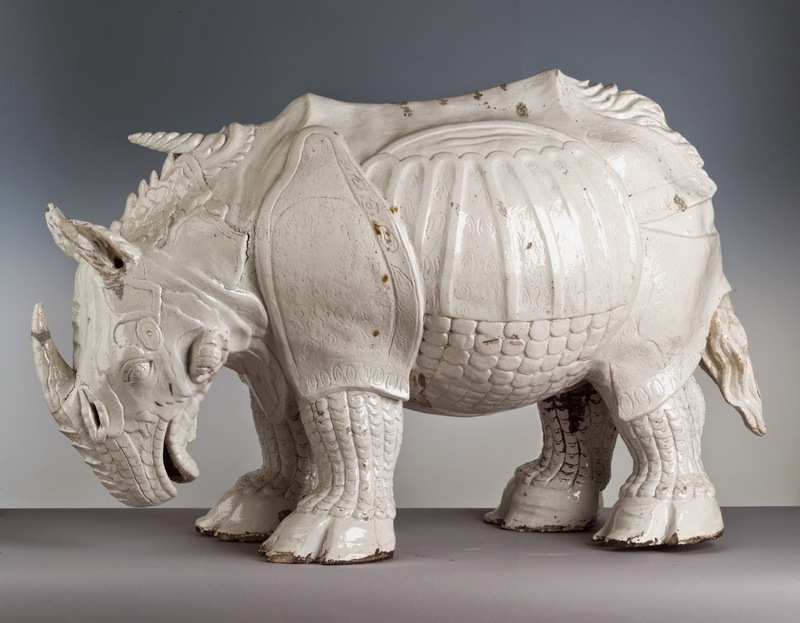 The rhinoceros was made in the Meissen porcelain factory by Johann Gottlieb Kirchner, using as blueprint a print by Albrecht Dürer. Neither man had actually seen a rhinoceros, but I don't care about that; I adore this animal. It was made in the newly-discovered 'white gold' Saxon-crafted porcelain (the discovery of an alchemist who Augustus the Strong locked up till he had discovered the secret. Till then, actual porcelain had to be imported from China. So called 'Dresden' actually Meissen porcelain was the result. I visited the Zwinger porcelain museum in 2009, which was a wonderful experience for a person as obsessed with ceramics as I am. 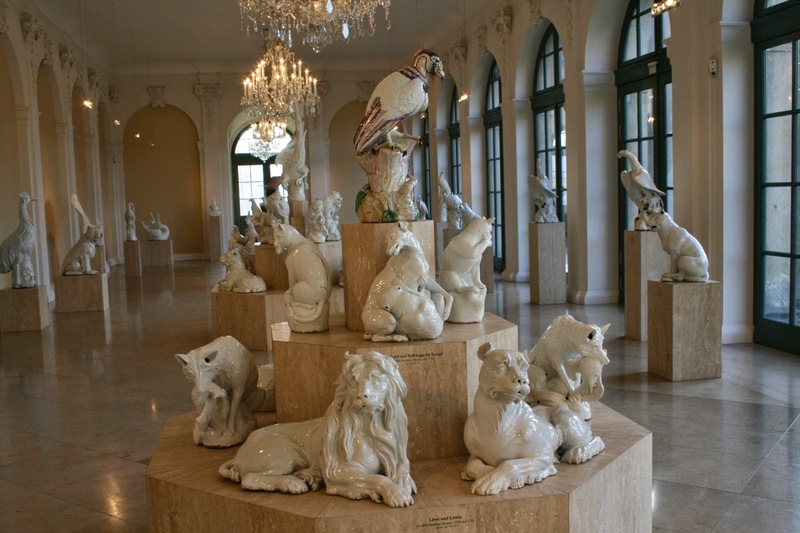 My husband bought a photography pass, so here are some other denizens of Augustus's porcelain menagerie. We were rather taken with the sad-faced lion. Meissen china is a taste I inherited from my mother, and I have bought a few pieces of the classic German/Czech/Austrian Zwiebelmuster 'onion design' a blue and white pattern derived from Chinese motifs. If I could afford a complete dinner-service of this, I would, and if I ever get rich I will.. It was off this pattern that Jenny, in Saving Rafael ate with her capitalist uncle Hartmut after he had winkled her out of juvenile concentration camp. He was rich enough to afford the complete dinner-service. I suppose my affection for the Zwiebelmuster (actually, the 'onion' is a pomegranate) demonstrates in my psyche some pretty typical but perhaps old-fashioned German middle-class aspirations - but to me it is just one of the loveliest and most elegant blue-and-white designs in the world. above is a statue of one of them, made from ceramic fragments by Max Lachnit in c1945 - like these women, Germany has had to reassemble herself. I myself have gone through this psychologically painful and strenuous business of Vergangenheitsbewältigung, and I know of what I speak. What one finds when going through this process is connection to those parts of German heritage that are good; and that is what this exhibition gets across. Moreover, it does not come to a halt in 1945, but goes on beyond. And - though there have been problems and uglinesses following that night of 9th November 1989, though turbo-capitalism has surged ahead, though there have been frictions between East and West, there was that night, and looking back at it, I for one find tears of joy coming to my eyes. I am not ashamed of them. Do go and see the exhibition. It is well worth it. All photos not otherwise accredited are from the British Museum Press Office. I have been loving the accompanying series on Radio 4, although I am listening late on 'catch up' and can still look forward to many more episodes. One of the best things I have heard on radio recently. I also love that death is unpredictable in his calling hours. Thanks Leslie. I suspect that the exhibition is probably even better, if you have listened to the radio series first. I read the book (it needs heavy lifting equipment, though, but it's excellent too) and found that very useful, even with the cultural resonances that I have.. I really would like to see this exhibition. Thank you, Leslie, for alerting me to it and with this excellent personal response. We have several friends whose lives have blossomed and found new dimensions, new directions since the wall came down and they have been free to travel - indeed we would never have met them or worked with them otherwise. Thank you for this excellent post, Leslie. I do feel woefully ignorant about Germany, but your books and blog posts help. Will definitely try and see this exhibition at Christmas time if we can get tickets. I love that blue and white china. Thank you for the reminder of Kollwitz's work - I was lucky enough to do a course on German C20 art with Shulamith Behr, who introduced her to us. Beautiful.